Shows like Pawn Stars, Antiques Road Show, and American Pickers are popular because we all love to think we may have something valuable hiding in the basement or garage. Well, it's not just antique firearms, gold coins, and old paintings that rise in value. Here are 10 collectibles that you should be looking out for. They could easily make you a profit today, or some day in the future. You may not know about the collectability of sneakers, but there is a massive resale market for them. In fact, people are trading sneakers much like they trade stocks, and values will only go up as time passes. Of course, not every sneaker is going to be a collectible. The ones you want to look out for are limited edition styles, most of them made by Nike. For instance, a brand new pair of original 1985 Nike Jordan 1 OG Bred cost just $65. Today, they are worth…$2,715! Every week, people will stand in line for hours, or even overnight, to grab a pair of Nike or Adidas sneakers, and can literally double or triple their money in seconds. But hold onto them, and the price will soar. Even gently used sneakers can earn big money. There are scores of websites dedicated to the buying and selling of comic books. Some people invest in them in the same way they buy art, or even land. Of course, the vintage comic books in pristine condition will always be worth the most; Action Comics #1, published in 1938, sold for almost $1.4 million. However, don't think that old comics are the only ones worth collecting. A mint condition copy of The Walking Dead #1, published in 2003, can fetch you $11,000! When buying comics, even new releases, look for collectability. A #1 of anything will always be worth a lot. The first time a character is featured or introduced, that will also bag you more money. And if you see printing errors, grab it! Next time you see a stack of board games at Goodwill, or a garage sale, take a closer look. Some of them could be worth a small fortune. And, they don't have to be all that old, either. For instance, a board game called Star Wars: The Queen's Gambit is currently changing hands for between $300–$1,000, depending on condition. Most of the time, the board games that rise, and rise, are the ones that are either limited edition, or based on a cult TV show, movie, or even an amusement park ride. Another big seller is Disney's Haunted Mansion, released between 1972 and 1975. It will net you a cool $250 if you find one, and will be an investment if you hang onto it. Many current board games will also rise, too. Just keep them sealed, and in a safe place. If you're a big reader, it's possible you have some hidden treasures on your bookshelf. Vintage books, especially first printings, can be very valuable. But they don't have to 18th or 19th century to be valuable. The Pulitzer Prize-winning novel A Confederacy of Dunces, by John Kennedy Toole, is one such example. First published in 1980, at a small run of only 2,500 copies, this original printing will currently bag you up to $4,000. Sadly, your typical Xbox One or PS4 game is not going to rise in value. Quite the opposite, in fact. But many video games from the 80s and 90s continue to be worth more and more. And this is not chump change, either. Stadium Events, by Bandai, was released in 1987. But it was pulled shortly after, and destroyed for marketing reasons. However, 200 had been sold. If you ever find one, it can be worth over $40,000! The box alone is worth $10,000. Games from the 90s that are rising in value include Super Copa, and Nintendo Campus Challenge. Like anything else on this list, but especially with toys, the condition and rarity is a factor. No one is going to give you heaps of dough for a beat up Hot Wheels car that everyone owns. BUT, if you keep them in the package (which is tough for kids to do), and hold onto them, you'll see a nice return on your money. If you're really lucky, your Hot Wheels car can be worth more than an actual car. Take this pink Volkswagen 1969 Rear-Load Beach Bomb — valued at $100,000! You already know why these will become valuable. As technology has advanced, and become fairly cheap, GPS maps are everywhere. You don't even need an actual GPS unit, like a TomTom or Garmin anymore. Your phone gets you wherever you need to go. So, maps are becoming extinct. And extinct means money. A site called Old Maps is a handy research tool that can let you know how valuable the maps you own are. And if they're not all that valuable now, give them 10–20 years. That foldable map of your city, or an old atlas collecting dust on a shelf, is only going to rise in value. Who would have thought that vinyl would make a comeback? When CDs, MiniDiscs, and then MP3s came along, vinyl was suddenly cumbersome and annoying. But purists emphatically stood by LPs, citing their superior sound quality. Now, they're back, and getting more popular all the time. Your old vinyl collection almost certainly has a few gems in it. And new releases will rise in value over the coming years, especially limited edition pressings. Treat your vinyl well. Buy plastic vinyl sleeves to protect the art. Show the kids how to treat your vinyl with respect. It will pay off. Oh, and whatever you use to play that vinyl on, that could very easily become a valuable collectible, too. Stamp collecting is something most of us know about, but consider to be something of a nerdy hobby. However, get past the name and you will uncover a world of diverse and beautiful art from around the globe. Stamps can be bought for pennies, and will almost always rise in value as the years go by; especially if they are not cancelled, and you keep them in mint condition. Over 10,000 stamps are issued around the world each year, so collecting every single one would be expensive, and take up lots of space. Focus on specific countries, or themes, and create albums. If you get lucky, you may buy a bag of assorted stamps that contains a million-dollar treasure. There are many franchised collectibles that will rise in value, but these two are the most consistent, and easy to come by. Toys from McDonald's Happy Meals can fetch many thousands of dollars. There are collectibles guides and websites devoted to them, so when you buy a Happy Meal, consider purchasing an extra toy to keep in the bag. And then there's Disney. 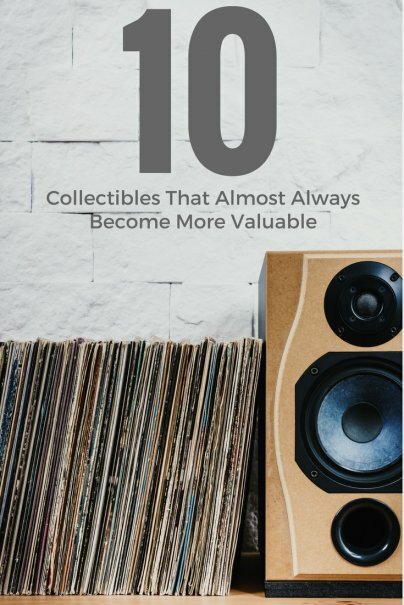 It's beloved by everyone, and when it releases anything, from toys and stuffed animals, to plates, posters, and jewelry, it has the chance to rise in value meteorically. Pay particular attention to the limited edition snow globes. Buy one now, you will be able to sell it for many times the retail price in a few years. Have any collections? What are they worth?